Newcastle Falcons will hold next season's 'home' Premiership game against Saracens in Philadelphia. The match will be held on 16 September, at MLS side Philadelphia Union's 18,500-capacity Talen Energy Stadium. 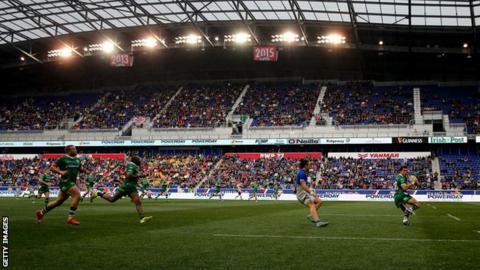 Saracens were involved in the first Premiership fixture played in the USA, beating London Irish 26-16 at New York's Red Bull Stadium in March 2016. "This is an exciting opportunity which is commercially very good," Falcons managing director Mick Hogan said. "We are excited and honoured that Newcastle Falcons will represent the Premiership in what is going to be rugby's next huge market."